Accurately sampled from one of the funkiest keyboards ever created: the iconic D6 model Clavinet is famous for its percussive playability and gritty sound. The original Clav has always held a special appeal in funk, fusion, rock and soul music for its unique melodic twang and sonic versatility, from brilliant, vibrant, nitty and gritty to soft, rich, mellow tones. 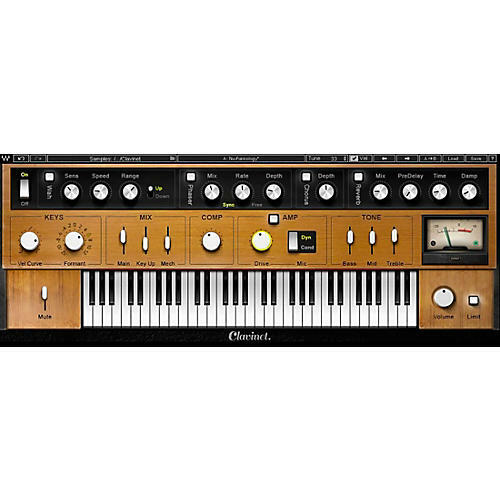 For this instrument, we meticulously sampled every texture, articulation and hammer tip string-striking mechanic of the authentic D6 Clavinet in both the muted and unmuted modes, recreating all the dynamic control, feel and expression of the original funkified icon. Using only a few controls, you can achieve an array of deep sonic textures, capturing the distinctive timbre of the Clavi’s unique single-coil pickups. Choose from the selection of factory presets, featuring patches modeled after Stevie Wonder’s “Superstition,” Billy Preston’s “Outta Space” and other classic songs; or shape your own tones using the built-in auto-wah, amp overdrive and other effects.